White Skull are back with the second album following the departure of former lead vocalist, Federica De Boni. Two albums into the Gus Gabarro era of the band, I'm still not sold on this lineup of the band. De Boni gave the band a unique personality; harsh female vocals certainly are not commonplace in the world of heavy / power metal. The band still retains their Grave Digger / Blind Guardian style of power metal, but the various shortcomings of this album preclude me from issuing a recommendation for this album. Let me start with the positive observations that I made of The XIII Skull. Tony Fonto and Danilo Bar have delivered an excellent performance on guitars. The riffs are heavy, chugging along like a freight train for the duration of the album. The guitar tone is heavy and aggressive, drawing the Grave Digger comparison, as opposed to a more uplifting, happy Euro power metal type of feeling. A steady dose of guitar solos and shreds are on tap for the listener, providing somewhat of an 80's traditional heavy metal element to the sound. All in all, the musical skills of this band are very competent. Drummer Alex Mantiero delivers an energetic, frantic, yet precise performance behind the kit. He teams up very well with the guitar duo to provide an intense and heavy sound. If only the bass could have been more prevalent in the mix, the impact would have been even greater. The band pulls off some Blind Guardian epic-like arrangements with success, especially during the second half of the album. Creature of the Abyss and Power of Blood are arguably the most dynamic songs of the album, with their acoustic guitar textures and epic and even medieval (particularly Create of the Abyss) atmosphere. Mothman Prophecies also contains some diverse songwriting, with some modest orchestral overtones. While The XIII Skull has some bright points, it also has some prominent low points as well. After hearing Gus Gabarro for two White Skull albums, I am convinced that he just doesn't cut it behind the mic. The guys sounds extremely strained in his delivery. To use the Grave Digger reference again, Gabarro has the same gruff sounding voice (albeit less aggressive), and I must admit that he sings with emotion. However, his delivery is thin and I can't help but think he is straining in pain to hit and sustain some of these notes. As mentioned above, Creature of the Abyss has a noticeable Blind Guardian feel to it, with Gabarro even trying a bit to sing like Hansi Kürsch. Unfortunately, he sounds like Kürsch with strep throat on this track. In more than one instance, I noticed that the harmony vocals sound like one of the band members is a half pitch off compared to the rest of the band members. This is a mistake that happens all too often on this album. The production in general almost has a demo quality to it. It severely lacks clarity, and the bottom end of the sound (bass) almost sounds ignored. To give you a better image, I found myself wondering if The XIII Skull was recorded live in the studio, with very little polishing. In recent years, Italy has produced a great number of metal bands. The most common deficiency of these bands are weak lead vocals and poor production. After hearing The XIII Skull, it seems like White Skull has fallen into that mold. Lastly, I'll comment on the melodic quality of the album. Although White Skull are more aggressive and heavier than most European power metal bands out there, they seem obsessed with sing along choruses on this album. As a fan of power metal, AOR ,and hard rock, I don't have a problem with catchy choruses at all. 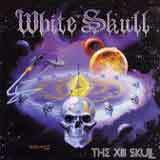 However, White Skull have settled for quantity over quality with this album. You'll hear dozens of chorus lines throughout the album, but they sound too generic to stand out past the second or third listen, with the exception of a very few. Although I can't highly recommend this album to those other than die hard fans of White Skull, there are some good ideas on this album. Most importantly, I'd like to see the lead vocals and production improve. The band members have excellent technical skills and songwriting skills (when not trying too hard to come up with sing along choruses) to come up with a better album. With the sheer number of power metalbands out there, it will be hard for White Skull to break into the top tier unless they improve their output. This type of album has been done many times before, and better. However, I am confident that the band can and will do better than this.